The National Sports Festival, which is considered as Sri Lanka’s little Olympics, is once again conducted on a grass track in Polonnaruwa, with the Island’s only living Olympian, Susanthika Jayasinghe, participating as the Chief Guest. The world has moved on from grass tracks to synthetic tracks several years ago. None of the top countries conduct their National level competitions on grass tracks anymore, and certainly not countries that have won Olympic track and field Medals. 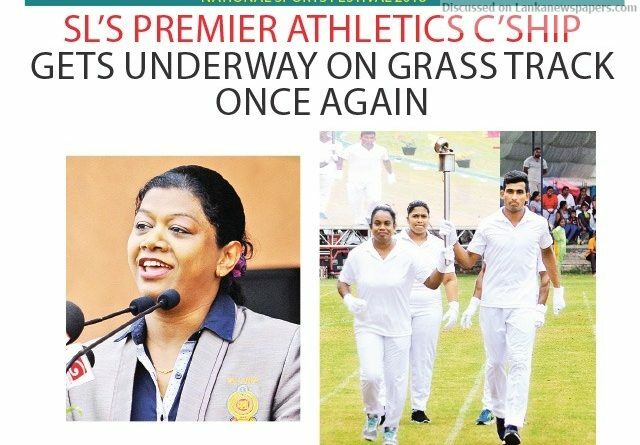 Since track and field produced the only two Medals for Sri Lanka at the Olympics, and all the Gold Medals won at the Asian Games, track and field athletes expect their most competitive event of the year to be held on good surfaces, but year after year they met with disappointment as the NSF keeps moving from one grass track to another, which are uneven and full of holes. These uneven dry surfaces aren’t helping our athletes’ to improve their performance. After conducting the last NSF in Matara, former Sports Minister Dayasiri Jayasekara promised that in future the NSF will be held on synthetic tracks, finally giving a glimmer of hope to National athletes as the next event was scheduled to be held in Ratnapura on a newly laid synthetic track. Even though tenders were called to lay a new track in Ratnapura, the project did not get take off since the Ministry had to reschedule the event. Many suggested that it should be held in Colombo on the newly laid Sugathadasa Stadium synthetic track, where athletes will have good facilities to produce good results, as the cream of the National athletes participate in this competition. These athletes have run at Divisional meets at District and Provincial level to qualify. However, the NSF decided to move the event to Polonnaruwa under the slogan ‘Sports for the village’, even though the so called ‘village’ doesn’t even know that there’s an event of this nature happening in their own backyard. On a positive note, Olympic Silver Medalist Susanthika Jayasinghe was invited as Chief Guest, whereas mostly politicians have usually been invited earlier. Jayasinghe said it was the biggest recognition given to her from the country for the last 18 years since her Olympic Silver Medal in 2000. Polonnaruwa has hosted the NSF three times, the last being in 2009. The quarter miler who was part of Sri Lanka’s 4x400M team which clinched the Bronze Medal in the 2013 Asian Championship, Kasun Kalhara Senevirathne and H.G.L. Priyangika the netball champion who represented Sri Lanka at the Asian Netball Championship lit the Games lamp. The Championships will go on till the 14th where the Boxing, Wrestling, Kabbaddi and Netball finals are included apart from the three- day Athletics Championship.